RHYTHM OF THE NEEDLES: Do You Know This Pattern? 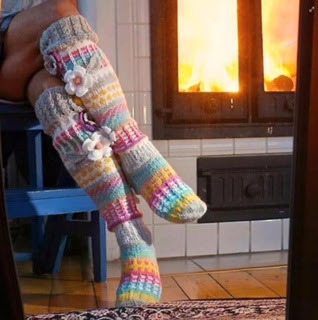 I got an email from a friend, trying to track down a pattern for these socks. They look like they might have been made from worsted weight yarn, or maybe DK. They look heavier than the usual sock yarns. There’s some texture going on but I don’t know if it’s slip stitches or fair isle or something else. I can’t tell if the flowers were knitted or purchased and sewn on. I’ll bet there is some shaping for the calves. The easy part would be copying the colors from the picture and making stripes. Have you seen this pattern anywhere? Drop me a note in the comments if you have. Update: The pattern has been found and it's called Anelmaiset (Ravelry link). Thanks again. Appreciate your efforts to find this pattern for my friend. And, so quickly!